What’s the biggest use of my time right now? Social media. You? 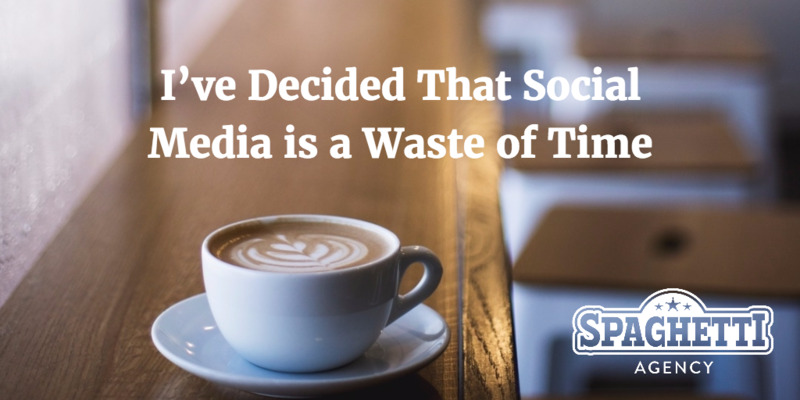 I bet you’re spending more time on social media that you’d care to admit. There’s a really cool app called Moment if you need proof of that. … but it’s a time-drag! The thing is, social media could be great for your business if you didn’t just do social media. Join it up – social media isn’t a silo! Social media isn’t THE answer to your business challenges; it’s part of it. Don’t expect some LinkedIn connections and a Facebook page to bestow business on you. You must join it all with other marketing and business development that you’re doing. We do a lot of networking, for example. From those connections in real life come connections online and vice versa – It’s all linked up! If you’re spending lots of time online, try to get your fans and followers on your email list. Offer some free content or a reason to sign up, and then you’ll be able to build on that relationship in their inbox too. Whatever you do, whether that’s leaflets, radio, magazines, PR, – join it all up! Years ago I drove a van for a wine merchant. I also tweeted for the company I was driving for, too. Twitter was a real success for me and I thought at the time that I was a genius at Twitter. That’s what was making all the great things happen – Twitter! Actually, the wine merchant had a good following already and I bounced off that. They had some awesome stories and I shared those too (you can’t polish a turd – you need great content to share). I also ran networking events with two lovely ladies, Karen and Christie, who I met on Twitter. Those events also created noise for me and then on Twitter. It drove the conversation. I also blogged a lot and that was shared online and gave me a profile too. It wasn’t Twitter alone that did it for me. But I used to think it was. Seriously, they’re not. The more ‘old fashioned’ marketing still works and they’re still areas you should look at but… … bolt on social media to them and they fly! Recently we were involved with a local poster company who made some posters on behalf of a lady, Linda, who had been cheated on by her partner, Graham. The posters alone were a unique thing, although very old school, and they were put up on lamp posts across the town. On their own they were just a funny and intriguing sight that prompted questions – but with social media they generated a global viral story! Once the posters were snapped by locals on their smartphones and shared in Facebook groups and all over Twitter the media were onto it. Within a day the Daily Mail had featured it and then the rest followed suit. We lost track of all the articles that were published globally, but they included: The Poke, The Metro, The Huffington Post, The BBC, the local radio and newspapers and even Cosmopolitan magazine. Without social media this wouldn’t have got as much noise… but without the posters there was no social media story. Social media works best as part of a joined-up campaign. Please stop emailing and calling me asking for social media when you’re doing nothing else, because it won’t work! It works together to blow up a storm but on it’s own can be a bit of a drip. Joined up thinking… it works! Great headline, and great article. I used to think Twitter had brought me tens of thousands of pounds worth of business. I still tell people that as a shorthand way of communicating how great social media can be. But in reality, Twitter just made people aware of me and the kind of person I was. The new business I got was almost always due to personal connections which had grown from Twitter, whether it was meeting people at Tweetups, or at trade shows. If you’re social on social media, and then continue to grow online relationships offline, it can lead to friendships, business, and opportunities you’d never imagine. For example, in the past year I’ve been asked to trial two high end professional courses ‘because you’re good at what you do, and you’re great at social media’. In both cases I’d met the companies on Twitter, chatted to them on Facebook Messenger, and then met them at trade shows. It’s all about growing and nurturing relationships. I think the reason you’re SO good on social media Todd is that you’re social. And honest. And friendly. And helpful. You’re you, the human being named Todd (or Graham, sometimes). You’re bloody good at blogging too. Thanks Charlie. That’s exactly what I tell everyone I work with – be YOU. It’s your USP and it’s your way to people’s hearts, minds and wallets!